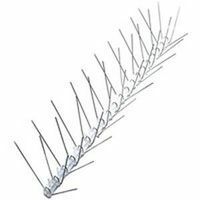 Stainless bird spikes permanently stop pest birds from landing and roosting. Ideal for window ledges, pipes, beams, signs, gutters, chimneys or anywhere pigeons or other birds roost. Surgical stainless steel construction, supplied in one-foot strips, glues down permanently to any surface. Durable polycarbonate base is flexible for curved surfaces. Base is scored every inch for exact fit.